In my last post I discussed the option at Amazon.com to download order reports. The results of my reports for 2011 and 2012 provided data for the chart below. When comparing the end-of-year total for each year, I see that I spent about half as much in 2012 as 2011. 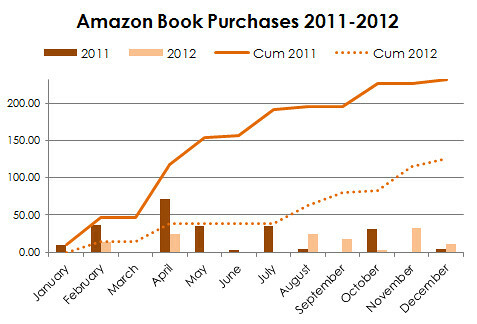 This chart and the one below use data from business-related books. Additional analysis comparing books purchased directly from Amazon (new books) and from other vendors via Amazon (used books) reveals the following. I purchased approximately the same number of books, and the result was that I spent half as much in 2012 as I did in 2013. For me, purchasing used books is a successful money-saving approach. Take data that is available in your life and think about ways to analyze it and identify trends.